Do you want to know more about how to improve your students’ health, behavior, and achievement through movement? Sign up for EdWeb's webinar here! As teachers, we know that kids need to move. But it can be hard to carve out the time during the middle of class, find the space or know exactly what to do. There’s also the issue of settling everyone back down after they’re all pumped up. Research shows powerful links between physical activity and academic performance, including improved grades and standardized test scores. 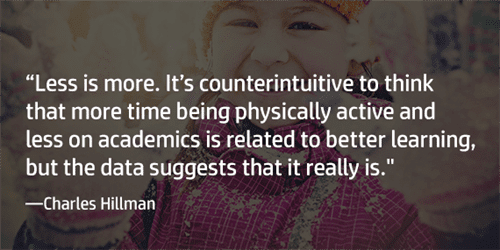 Not only does exercise make kids healthier, it can help them focus and behave better in class. Just as adults don’t sit still at their desks all day, kids shouldn’t be expected to either, says Charles Hillman, a professor in kinesiology and community health who has studied the impact of exercise on learning at the University of Illinois at Urbana-Champaign. So what can schools do to make sure kids are getting the recommended 60 minutes of moderate to vigorous physical activity they need every day? Don’t rely on recess and gym class. “It’s a poor assumption to think that students get all their energy out in P.E. and recess,” says Hillman. 4%: The percentage of schools that require daily physical education or its equivalent for students in all grades in the school for the entire year. 29%: The percentage of high school students who attended physical education classes daily decreased from 42 percent in 1991 to 29 percent in 2013. 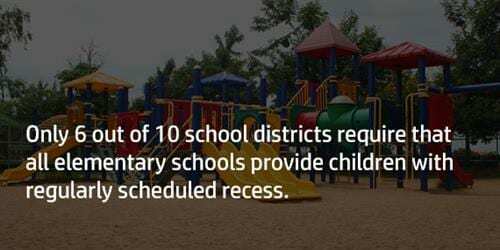 60%: About 60% or 6 out of 10 of districts require elementary schools provide children with regularly scheduled recess. Add what you can to make your classroom environment welcoming to movement throughout the day. 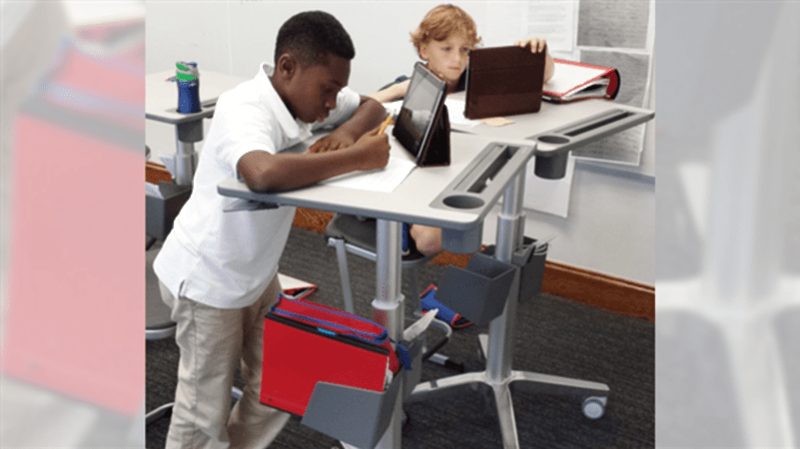 Standing desks that students can self-adjust throughout the class—to help them stay more focused and energized. 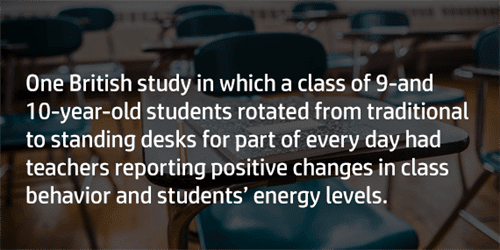 One British study in which a class of 9- and 10-year-old students rotated from traditional to standing desks for part of every day had teachers reporting positive changes in class behavior. (Source: UK study finds significant health benefits associated with standing). In addition to recess and physical education, experts encourage classroom teachers to get kids moving in the classroom with regular breaks. “Attention spans begin to wane after about 40 or 50 minutes of intense instruction,” says Francesca Zavacky, a physical education teacher and project director for SHAPE America/CDC Cooperative Agreement Project. Get creative with fun moves. Don’t know how to get kids moving without bumping into one another in your tight classroom? It can be easy to do with some help from your physical education teacher or free online resources. Check out Go Noodle or JAM School Program for ideas on quick exercises. Avoid formal calisthenics, and be creative. Make “fit sticks” with various activities—doing the twist, serving tennis balls or paddling a kayak—written on craft sticks that the students choose and do together next to their desks, suggests Lisa Perry, national physical education and health education advisor for the nonprofit Alliance for a Healthier Generation. “The teacher needs to participate as well and be enthusiastic,” adds Perry. To refocus after a burst of exercise, Perry suggests having students do breathing exercises or poses. For instance, try a “standing pretzel” where you cross your legs, cross your arms and fold your hands up in front, and inhale. “It requires concentration. They settle down but don’t realize they are doing it,” says Perry. During instruction, be intentional about weaving in movement. For example, have students rotate throughout the room at stations or work in pairs and get up to switch partners. Post problems on the walls that students walk up to solve and then have to find another location with the right answer. Walk around the building to take an inventory of other spaces where physical activity could occur, advises Zavacky. You might identify a place where students can recite math tables while jumping rope. Brain research shows that when students hear, move and experience information through physical activity, it can cement instruction. The right mobile adjustable standing desk can support all of this. Support for physical activity in the school requires some flexibility and support from administration as well, notes Zavacky. It may take challenging established protocols to initiative programs, but she encourages teachers to be creative.